The season of warm soups and pumpkin spice everything is upon us, but it is difficult to give up your days outside as the seasons change. Luckily, you don’t have to with a little bit of foresight. Creating a dreamy outdoor space for yourself to enjoy this fall will give you some additional time outside as you make the transition into the colder months. Just because the temperatures are dropping and precipitation is increasing doesn’t mean that it is time to put away the lawn mower quite yet. If anything, it is time to organize your garden shed and get to work out in the yard. It is difficult to enjoy your outdoor space if the yard looks like you’re getting ready to set up a corn maze. Pull out your weed eater and rake and get to work preparing your yard for the fall. It is nice to have things growing in outdoor areas. If you have a garden and live in a temperate climate, your planting season may not be over yet. Consider planting some new trees to enhance your outdoor space aesthetics. As their leaves fall off during the autumn months, the trees turn their attention to their roots and absorbing nutrients. Fall is an ideal time for them to establish themselves in your yard. Additionally, the fall is a great time to be thinking about what your outdoor space will look like come spring. Planting bulbs in the fall is how you come to have blooming tulips and daffodils in the spring. The colder winter months is what triggers them to grow. Enjoying your garden by prepping for next year’s spring blooming season is a great way to soak in the joys of your space. Take a long look at the outdoor space that you have available to you. Note which areas in that space have the best views of your favorite tree or of the surrounding skyline. Then consider how you can best enjoy it by taking a seat. There are many different options such as hanging a hammock, building a swinging bench, or purchasing some comfortable patio furniture. Having a nice space to lounge is essential to designing your dream outdoor-space — even if you don’t have much space to work with. If your space is limited, such as a deck of an apartment, spruce it up with some color with things like hanging plants or accent seats that you can enjoy while outdoors. Including an ottoman that can double as storage will allow you to store blankets or the cushions to your outdoor furniture on those rainy autumn days. If you are wanting to have the best of both worlds on wet days, open the doors of your shed, barn or house and enjoy the comforts of being indoors while smelling the rain. Consider creating your very own she-shed (a counterpart to a male’s “man cave”) where you can sit and watch the rainfall on your favorite outdoor space as the weather turns from cool to cold. As the weather cools off and the days get shorter, staying warm while outside will once again become a challenge. If you are accustomed to eating your evening meals at your outdoor dining table, consider a propane heater to extend your outdoor dining season. 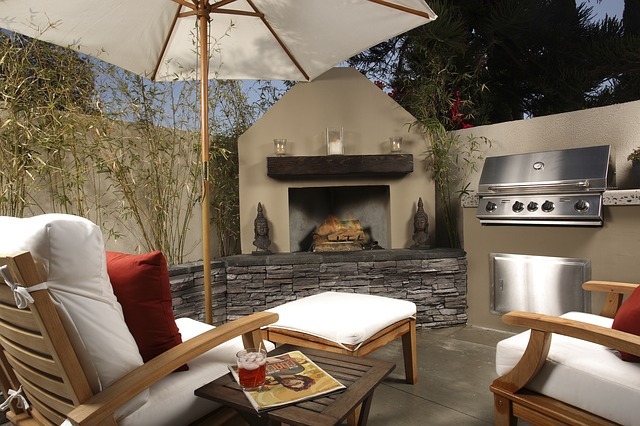 To enjoy the sunset on those chilly nights, arrange your patio furniture around a gas fireplace that you can relocate to and from your garden shed as needed. They alleviate the need to dig out a permanent fire ring in your outdoor space, where you may want to use it for other things in the future. If you prefer the ambiance and smell of a real wood burning fire, find a spot around a chiminea and bask in the light and warmth of an earthen hearth. Setting yourself up for the cozy colder months to be spent outside is a gift you can give to yourself. There is nothing quite like dragging a blanket, book and a cup of tea to enjoy on a fall afternoon. Instead of lingering in the last days of summer, embrace the fresh days of fall.